Deleting Construction History is one of the best measures to ensure a scene doesn”t crash in Maya or behave unexpectedly during export to FBX. History deletion should be followed in relatively the same manner as saving, early and often. Construction History is a backlog of information created when working on a mesh. 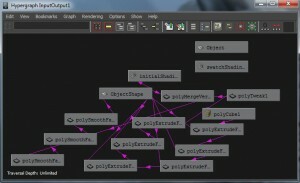 Nodes are created with every action, storing the information being performed on the object. It’s a necessary when using soft body rigging or deformers, by storing information about the mesh. When working on organic/complex models construction history can help deeper into modeling. After smoothing, a node is created containing the old mesh, if a problem occurs later on that would make it easier to use the lower poly mesh, you can revert to that node and start working from there. To turn off Construction History temporarily click the Construction History On/Off Button located in the Status Line. 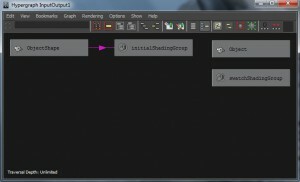 Open the Channel Box/Layer Editor. Under the Inputs space, if there are multiple nodes within this space, then there is history stored on that mesh. To quickly clean all history for an entire scene go to Edit > Delete All By Type > History. This will clear your scenes of all unnecessary construction history. Keep in mind that this will also delete all nodes relating to deformers, such as: smooth skins, or lattices. For deletion of construction history that maintains the deformer relationships use Edit → Delete All By Type → Non-Deformer History. 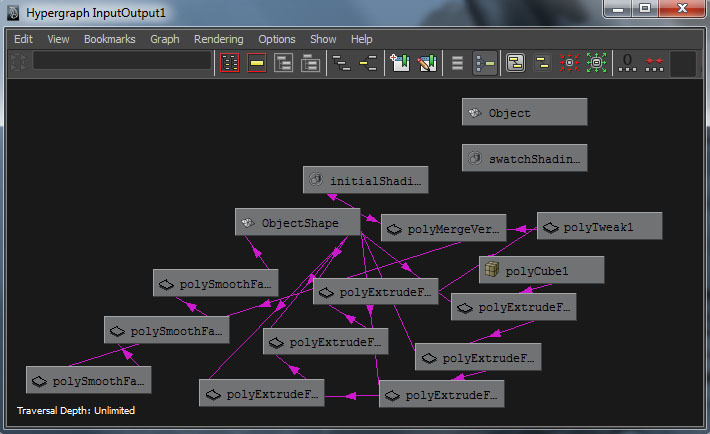 In the Hypergraph Hierarchy you can choose to see the individual nodes created for specific objects. Here you can delete certain parts of the history that you do not wish to keep, or are unnecessary. This type of history deletion is more used in the role of rigging. To view the entire hierarchy of construction history click the Input and Output Connections button. This type of History is ideal. This example is only for one object, so with a multi-object scene, the hierarchy will contain more nodes. This amount of history is passable, but with multiple objects it will slow down render time and be prone to program crashes. So, Always delete history. This amount of history should never occur. This was created using one object, and it began to slow down Maya, any further history creation would have led to a program crash. With multi-object scenes containing this much history you will encounter problems rendering, exporting and using the Previzion system.